Sanctions may have cut Iran's oil exports by a million barrels a day. Yet the country is still producing oil at full tilt and storing the excess on tankers, as cutting back is complicated and potentially harmful. NEW YORK (CNNMoney) -- Despite sanctions that have crippled Iran's oil exports, the country continues to pump at nearly pre-sanction levels. And since the oil rich nation is struggling to sell its oil, it has begun funneling the excess crude to storage locations on land and sea. So why doesn't Iran simply turn off some oil wells to manage its production? Well, shutting off oil fields isn't as simple as turning a tap. It's a complicated process that ultimately could harm future production. An ocean of oil, but no takers: Up to 17 supertankers and seven smaller ships owned by the country's shipping company are anchored in the Persian Gulf and elsewhere according to the International Energy Agency. The ships have become floating storage facilities for oil that no one is willing to buy. 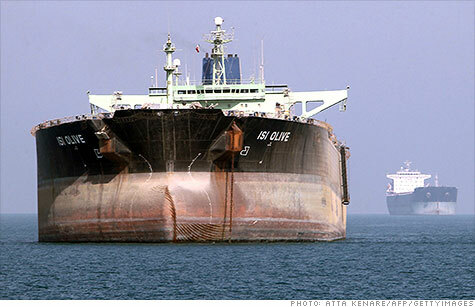 A cargo broker in New York estimated that Iran has used up about half its tanker storage capacity. At a million barrels a day, it's only a matter of weeks before storage runs out completely. "Then things get really interesting," said the broker. There have been reports that Iran is trying to sell this oil on the sly -- using middle men to broker deals with refiners or countries that don't care about the U.S. and EU sanctions. Others say Iran is selling its oil at a discount. A New York Times reporter recently traveled out to one tanker in the Persian Gulf that Iran had apparently tried to repaint and rename, presumably in an effort to dupe buyers into thinking its cargo is from some other country. But it doesn't appear that, despite its efforts, Iran is having much luck selling its oil. "The Iranians are incredibly resourceful, but I think the sanctions are really hard for them," said Daniel Gerber, director of Petro-Logistics, a Geneva-based firm that tracks oil tanker movements. "In terms of crude sales, I don't think they are having much success getting around them." Some reports said that Iran was shutting off the transponders that track the position and weight of tankers, leading to speculation the country was offloading oil to ships sailing under other nations' flags to sell it on the open market. But Gerber said most of the transponder shut-offs have occurred in Iranian waters, and that he hasn't seen much of a weight differential when they've been turned back on. These transponders not only measure a ship's position but also how low or high it sits on the water. The IEA, an organization made up of mostly industrialized countries that conducts extensive oil market research, also seems to think Iran is having a hard time selling its crude. In its most recent oil market report, the agency said Iran continued to pump oil at a rate of about 3.3 million barrels per day in May, just below its 3.5 million barrel per day rate at the end of 2011. Yet sanctions have cut Iran's oil exports by nearly a million barrels a day, said IEA. 0:00 /2:28Does OPEC matter anymore? "Iran may need to shut-in production volumes if export markets remain similarly constrained and storage fills up," the agency said. Cutting its oil production is difficult because Iran's fields are old and rely on pressure being constantly pumped down the wells to get the oil to flow. Stopping production could remove the pressure in the wells, which may make them susceptible to infiltration by salt water. Production could restart, but it would take time and a lot of money to remove the salt water from the oil wells. Barring a significant investment, the wells could be less productive than they were before the shut-in. While any permanent decline in Iranian production from closing wells would likely be modest, even a slight dip wouldn't be welcomed by the cash-strapped regime.